I have followed the career of Dr. Jane Goodall since childhood. I remember watching National Geographic specials with wide-eyed-wonderment. I was amazed at how Dr. Goodall observed chimpanzees in their natural habitat. A natural habitat can be defined as; the natural environment in which an organism lives, or the physical environment that surrounds a species population. I began working to support wolf recovery as a volunteer winter wolf tracker in the year 2000. Volunteer trackers were instructed to, “do no harm” in wolf habitat. In other words, do not disturb them. For instance, if wolves howled back on a survey, the survey was completed; we were instructed not to howl back, because that would be considered disturbing them. Wisconsin’s natural resources are kept in the public trust for now and future generations. I’ve been waiting patently since back in January for research to be published concerning the baiting of black bears. It was published this month in a research article, Consumption of intentional food subsidies by a hunted carnivore that reveals some startling results. The baiting of black bear starts in April and goes through to the end of September. That’s roughly six months of intentional food subsidies being fed to a carnivore. Not to mention, that’s a lot of disruption to the black bear’s natural habitat. Over four million gallons of bait is dropped in the woods for the purpose of hunting black bear. Bears are fed donuts, gummy bears, and cereal. Donuts have a high volume of calories, some doughnuts contain partially hydrogenated oils, which aren’t healthy for the heart, and most doughnuts are made with white flour. Glazed doughnuts contain 210 mg of sodium. Black bears are omnivores that eat food of both plant and animal origin. It’s no surprise that baiting black bear is a cause for alarm. It’s been controversial for a number of years. But what’s interesting now is the research points out a number of problems resulting from the baiting of black bear. Female consumption of high caloric food subsidies can increase fecundity (the ability to produce an abundance of offspring or new growth; fertility), and can train cubs to seek bear baits. According to the research this can increase a population above its ecological carrying capacity. 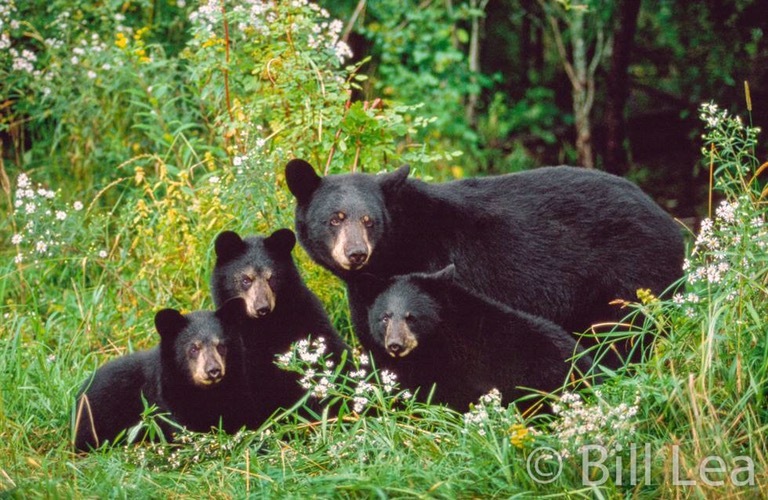 Black bears are omnivorous and spend spring, summer & autumn foraging for Native Forage, included known bear foods; berries, acorns, grasses and sedges, other plants, and white-tailed deer. Today, black bears in Wisconsin are being conditioned to search out human foods placed at bear baiting stations. This is influencing the black bears natural habitat. Researchers found that; humans are influencing the ecosystem not only through top-down forces via hunting, but also through bottom-up forces by subsidizing the food base. The Researchers found that if food subsidies (bait) were removed, bear-human conflicts may increase and bears may no longer be able to subsist on natural foods. High availability of energy-rich food can also alter denning chronology, shortening the denning period. The “heart” in conservation is missing when a species is managed for the sole purpose of harvesting it. 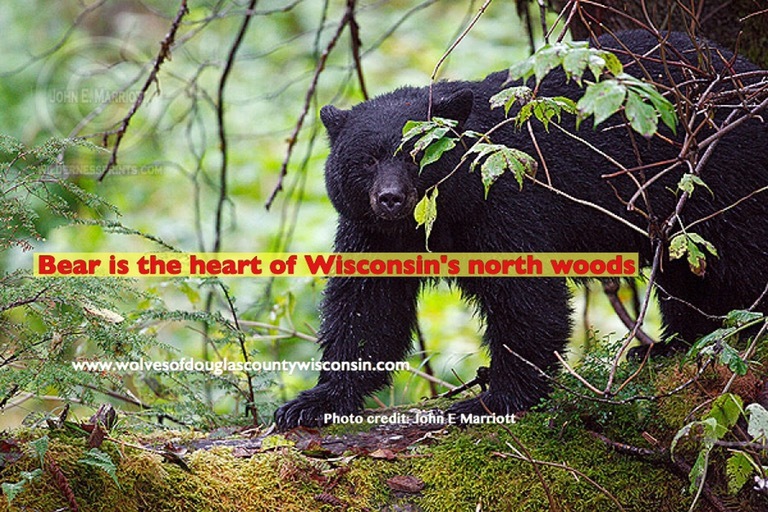 Wisconsin Department of Natural Resources estimates; most recent data indicates the bear population is currently estimated to be just under 29,000 bears. DNR manages bear population size through regulated hunting. In the end, black bears are managed for economic gain through hunting. Individual species should and must be managed for the good of the species and the habitat it depends. “Do not feed the wildlife.” Let’s bring back the heart of conservation. Nice message, Rachel. We need to jar the populace about this outrage. I have suggested dragging a bear cub carcass around the Capital Square until the stench is too much for the sold-out legislators. I would not want to dishonor a black bear cub’s spirit in such a manner; considering the bear is so pure and innocent & wouldn’t want to bring near such dirty politicians in Madison.